Move To Curb U.S. Corporate Tax Dodges Could Delay Reform Business and consumer groups say Congress needs to reform taxes, but few expect change soon. In fact, Treasury's tweaks to tax law may diminish the political will to address broader tax reform. 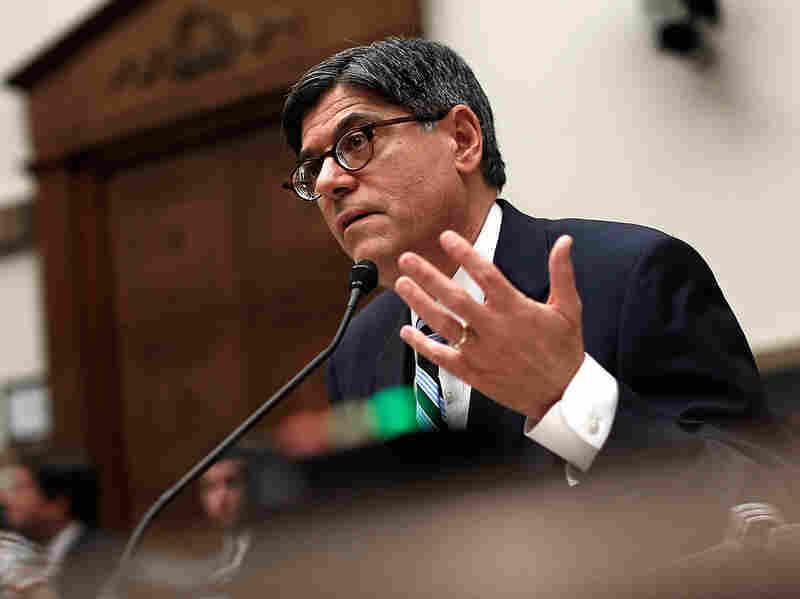 U.S. Treasury Secretary Jacob Lew has announced rules aimed at discouraging U.S. companies from moving their headquarters overseas to cut their tax bills. The Obama administration's effort to curb corporate inversions — the strategy of moving company headquarters overseas to dodge U.S. taxes — drew boos from business on Tuesday, and cheers from consumer and labor groups. No surprise there. But the Treasury Department's rule tweaks to discourage tax-avoidance deals also united everyone on one point: The country needs comprehensive tax-reform legislation. The Business Roundtable criticized the White House's "Band-Aid solution." And, the group said, the current system is "outdated, uncompetitive and puts American companies and workers at a disadvantage." Public Citizen said it "applauds the action" by Treasury, but the consumer-rights group said broader reform legislation is still needed. President Obama himself declared, "There's no substitute for congressional action." So Congress will jump right on it. This fall, lawmakers are focused on their Nov. 4 re-election campaigns. And next year, they may lose the political will to address tax reform precisely because unpopular corporate-inversion deals likely will decline in the wake of the Treasury's technical fixes to existing tax law. "The Obama Administration's limited action on inversions might take the pressure off for tax reform," Sen. Chuck Grassley, R-Iowa, said in a statement. Susan Harley, deputy director of Public Citizen's Congress Watch Division, likewise sees little hope for quick action on corporate tax reform. "I would say it's very unlikely to see comprehensive tax reform passed in the near future," she said. Here's how we got to this strange place where everyone agrees that 1) legislative action is more necessary than ever, and 2) that legislative action is less likely to happen now. In recent months, a number of American companies have acquired rivals based in other countries. They then switched their headquarters' addresses to take advantage of lower taxes overseas. The "inversion" goal was to cut their tax rates from as much as 35 percent to as little as the single digits in other countries. One headline-grabbing example involves Burger King, a Miami-based fast-food chain that has proposed a merger with a Canadian company, Tim Hortons Inc. That potential transaction, which would move the burger chain's headquarters to Canada, has stirred considerable anger among U.S. taxpayers, who would get left holding a bigger share of the nation's fiscal burden. On Monday, U.S. Treasury Secretary Jacob Lew announced some fairly far-reaching tax-rule changes that should diminish the number of "inversion" deals. The rules, which take effect immediately, are intended to cause U.S. companies to recalculate the cost of inversion, and then choose to stay home. The changes tighten the ownership requirements for U.S. firms seeking to do inversions, and make it harder for companies to avoid U.S. taxes on foreign income once the inversion is completed. Tax experts say the changes have teeth in them. Lee Sheppard, a contributing editor for Tax Notes, told NPR that "we expected some banging around the edges, but this is not around the edges. This goes to fundamental stuff." Experts predict opponents will launch legal challenges to the Treasury action, but that could take awhile. The more immediate reaction in financial markets showed the new rules are having an impact: Share prices declined for companies that seemed likely to get involved in inversion deals, like AstraZeneca PLC and Shire PLC. Harley, of Public Citizen, said a number of senators are still showing "some appetite" for making minor legislative changes this year. But as for a comprehensive reform package, "I wouldn't want to make any bets until after the election," she said.